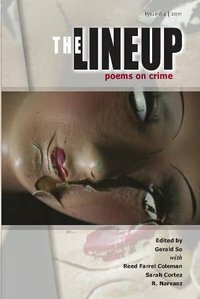 The notion of crime poetry — poetry about crime — may at first seem odd, but every poem can be seen as a crime poem. A stolen heart. A broken vow. A shattered reality. Paths are crossed. Conflicts ensue. Emotions recollected afterward. Or every poem might be seen as a criminal act. An act of independence. A rebellion. An assault on some status quo. Less metaphorically, many famous works of verse cover the waterfront of crime, from the blood-riddled epics, such as The Iliad to Beowulf, to poems grounded in death and violence, “My Last Duchess,” “The Death of the Ball Turret Gunner.” Not to mention the murder ballad. Directly, explicitly, The Lineup chapbook series continues this tradition of the crime poem. In this series, which I am proud to co-edit with Garrulous Gerald So, Remarkable Reed Farrel Coleman, and Superb Sarah Cortez, crime stories are (hard) boiled down to the intense moments and emotions of verse. The fourth issue of the series is now out, with works by Ken Bruen, Michael Casey, Reed Farrel Coleman, David Corbett, Mary Agnes Dalrymple, Mary Christine Delea, Jeanne Dickey, H. Palmer Hall, Paul Hostovsky, David Jordan, Laura LeHew, Thomas Michael McDade, Peter Meinke, Keith Rawson, Chad Rohrbacher, Stephen Jay Schwartz, Nancy Scott, Kieran Shea, J.D. Smith, J.J. Steinfeld, John Stickney, Caitlin Elizabeth Thomson, Randall Watson, Charles Harper Webb, Steve Weddle, and Germaine Welch. See what people are saying about the issue by following the month-long Lineup blog tour. Next PostNext Post Mayday, Mayday. This Is Asinine. Can You Read Me?